A camera mounted on the Centaur upper stage captured this dramatic footage of the spent first stage separation, deployment of the RL10 engine nozzle extension, the powerplant igniting and the rocket's nose cone falling away during launch. Moons circle planets, and planets circle stars. 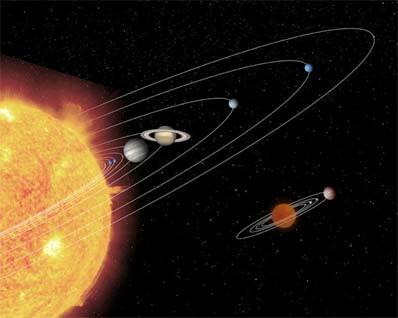 Now, astronomers have learned that planets may also circle celestial bodies almost as small as planets. NASA's Spitzer Space Telescope has spotted a dusty disc of planet-building material around an extraordinarily low-mass brown dwarf, or "failed star." The brown dwarf, called OTS 44, is only 15 times the mass of Jupiter. 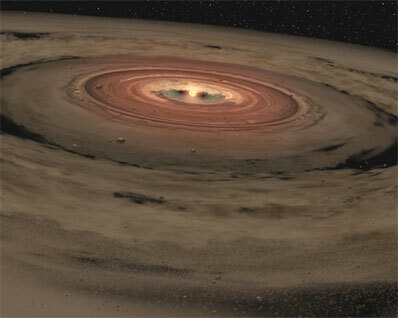 Previously, the smallest brown dwarf known to host a planet-forming disc was 25 to 30 times more massive than Jupiter. The finding will ultimately help astronomers better understand how and where planets - including rocky ones resembling our own - form. "There may be a host of miniature solar systems out there, in which planets orbit brown dwarfs," said Dr. Kevin Luhman, lead author of the new study from the Harvard-Smithsonian Center for Astrophysics, Cambridge, Mass. "This leads to all sorts of new questions, like 'Could life exist on such planets?' or 'What do you call a planet circling a planet-sized body? A moon or a planet? '" Brown dwarfs are something of misfits in the astronomy world. These cool orbs of gas have been called both failed stars and super planets. Like planets, they lack the mass to ignite and produce starlight. Like stars, they are often found alone in space, with no parent body to orbit. "In this case, we are seeing the ingredients for planets around a brown dwarf near the dividing line between planets and stars. This raises the tantalizing possibility of planet formation around objects that themselves have planetary masses," said Dr. Giovanni Fazio, an astronomer at the Harvard Smithsonian Center for Astrophysics and a co-author of the new study. The results were presented at the Planet Formation and Detection meeting at the Aspen Center for Physics, Aspen, Colo., and will be published in the Feb. 10th issue of The Astrophysical Journal Letters. Planet-forming, or protoplanetary, discs are the precursors to planets. Astronomers speculate that the disc circling OTS 44 has enough mass to make a small gas giant planet and a few Earth-sized, rocky ones. This begs the question: Could a habitable planet like Earth sustain life around a brown dwarf? "If life did exist in this system, it would have to constantly adjust to the dwindling temperatures of a brown dwarf," said Luhman. "For liquid water to be present, the planet would have to be much closer to the brown dwarf than Earth is to our Sun." "It's exciting to speculate about the possibilities for life in such as system, of course at this point we are only beginning to understand the unusual circumstances under which planets arise," he added. Brown dwarfs are rare and difficult to study due to their dim light. Though astronomers recently reported what may be the first-ever image of a planet around a brown dwarf called 2M1207, not much is understood about the planet-formation process around these odd balls of gas. Less is understood about low-mass brown dwarfs, of which only a handful are known. OTS 44 was first discovered about six months ago by Luhman and his colleagues using the Gemini Observatory in Chile. The object is located 500 light-years away in the Chamaeleon constellation. Later, the team used Spitzer's highly sensitive infrared eyes to see the dim glow of OTS 44's dusty disc. These observations took only 20 seconds. Longer searches with Spitzer could reveal discs around brown dwarfs below10 Jupiter masses. Other authors of this study include Dr. Paola D'Alessia of the Universidad Nacional Autonoma de Mexico; and Drs. Nuria Calvet, Lori Allen, Lee Hartmann, Thomas Megeath and Philip Myers of the Harvard-Smithsonian Center for Astrophysics. NASA's Jet Propulsion Laboratory, Pasadena, Calif., manages the Spitzer Space Telescope mission for NASA's Science Mission Directorate, Washington, D.C. Science operations are conducted at the Spitzer Science Center, Pasadena, Calif. JPL is a division of Caltech. The infrared array camera, which spotted the protoplanetary disc around OTS 44, was built by NASA Goddard Space Flight Center, Greenbelt, Md. ; its development was led by Fazio.